Timor-Leste - Where We Work - International - World Education, Inc. In 2011, World Education arrived in Timor-Leste, where approximately 50% of adults are illiterate, to provide technical and management support for a financial literacy project serving Timorese women. World Education supported women through the New Zealand Aid Teaching Financial Literacy Phase III project, which concluded in 2016. Building on our experience throughout the region, World Education is working with USAID's Avansa Agrikultura Project to train farmers in the municipalities of Aileu, Ainaro, Bobonaro, Ermera, and Dili on integrated pest management and safe pesticide application. 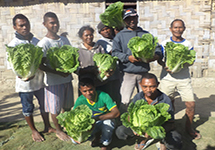 In 2013 and 2014, World Education provided technical assistance in Timor-Leste to improve agricultural practices and establish farmer groups and market linkages. World Education partnered with Moris Rasik, a microfinance institution that provides loans exclusively to women, to improve the lives of women with training in basic numeracy, financial literacy, and agricultural businesses.